My oldest started kindergarten this year, and with that comes learning the ABCs. This means most of my nights are spent looking at poorly copied indecipherable black-and-white copies of images whose first letters my son is supposed to learn. 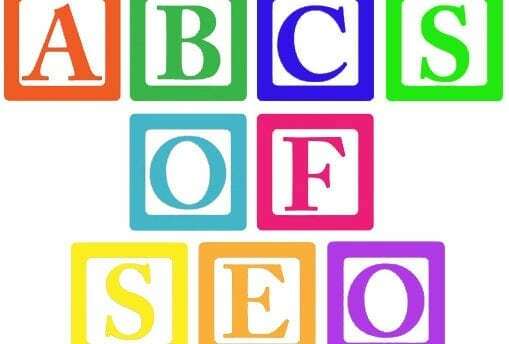 So when my time came to write for the Vizion blog, I got the bright idea to write out the ABCs of SEO. I thought it would make for a fun read, but when it came down to it I have to say that coming up with elements for each letter was tougher than I’d like to admit. Regardless, I was able to do it! A is for analytics. I know it’s painfully obvious, but seriously: What’s SEO if we can’t measure it? Analytics can tell us so much about how a site is performing and how what we do affects the site. It doesn’t matter if it’s Google Analytics or some other analytical data you pull (from software like SEM Rush). Any analytical data that can help you read your site is good data to have. C is for conversions. Conversions! Yay! This is one of the biggest (if not the biggest) tracking factors in SEO. Organic traffic is up 150%? Great, but how much money did the site make? That’s what it all comes down to: how many customers your site is gaining online or how many potential clients contacted the site. D is for design. The way a site is designed greatly affects other elements on the site, such as bounce rate, conversions and more important, user experience. While a great design can be fun to look at, what good is it if it sacrifices basic functionality? In addition, when redesigning your site you always want to make sure to take care of some common SEO factors. E is for e-commerce. E-commerce sites can be huge and a pain to deal with at times. Some e-commerce features to keep in mind are using canonical tags, getting product schemas in place, and setting up review pages to benefit from good user-generated content. It’s also a good idea to keep a close eye on old or discontinued products so you can redirect those pages as needed. F is for fresh content. A big rollout that excited a lot of people was the introduction of Google Caffeine, which indexed new content more quickly. Who doesn’t like that? But more than just getting a leg up in the search engine results pages (SERPs), you should always be looking for ways to create fresh content or refresh old content. G is for geotagging. Geotagging allows site owners to place GPS coordinates on pages, images, videos, and other items that can be added to a site. Do you have to use it? No, but this can be a big help when it comes to local searches. H is for header tags. Header tags are otherwise known as H1, H2, H3, and so on. These help structure the informational flow of a page. H1 usually gets the most attention because it’s the most important of the header tags, but don’t discount the rest. More often than not I’ve found sidebars and even some footers wrapped in the H2 and H3 tags. This is typically done because the site has been coded to use these tags to style the sidebar and footer text. The H1 tag usually has the biggest font, and then size gradually decreases with subsequent tags. Although it’s easy to see why you could use header tags to style the text, be careful: This approach actually creates topical dilution. I is for images. What’s a site without images? They are great visual aids and help spruce up a page that’s just a wall of text. But images also have their place. They need to be compressed, set to call proper sizes when loading, and described appropriately using alt tags. K is for keyword research. Every SEO campaign should begin with keyword research. Sure, most site owners may know what terms they want to rank for, but are those the best phrases to be targeting? Are there related phrases that could lead to new pages and content creation? Keyword research helps with creating content, targeting user intent, and crafting user personas. L is for link building. Links are vital to SEO. They may not have the same weight as they used to, but the fact is that links help search engines discover content. I think that’s something people fail to realize from time to time. But besides that factor, the way links are used also helps to define the way users and search engines see the content they’re about to access. I’ve heard it said that links are essentially advertisements. It’s true: Links are meant to be seen and clicked. M is for the meta description. It’s pretty basic, right? You’d be surprised how often this piece is ignored. While the meta description may not have as big an impact as the title tag or even link building, it still helps users determine whether they want to click through on a search result to your site. So while this might not seem like the ideal way to spend your time, if you have a low search result click-through rate you should take a stab at rewriting your meta descriptions. O is for open graph. Open graph is a feature Facebook rolled out four years ago. It helps determine what information is shared in the snippet displayed when you link to a page on Facebook. Is this a direct SEO factor? No, but as it’s been said several times, SEO is more than just on-site factors. If sharing a blog post on Facebook displays something strange, you might want to see what’s being pulled through the open graph coding on your site. P is for persona development. Persona development (fictional personas that represent various users that go to your site) can help you better understand what kinds of people use your site and look for your products. This can help you hone in keyword research, develop better content, and even improve conversions. Additionally, it helps you know who to look for and connect with on social media. These are the kinds of people most likely to share your content and tell others about your company. Q is for query searches on your site. Searching for something on Google is one thing; the ability to search for something specifically on your site is another. While it’s a good idea to block internal search pages from the search engines, you don’t want to discard that information entirely. The terms people are searching for on your site can help you come up with content ideas or ways to better navigate users to various sections of your site so that they don’t have to use your search function to find what they want. R is for reputation management. It’s great to have a good branding presence when someone searches for your company name (or even your own name). But what if something a little less than desirable shows up? You want to make sure you’re aware of what people are saying about you and what appears when people search for your company name. Part of this involves taking control of your site(s) and social media account(s). While it is best to use them regularly, you should at least claim them so that no one else can use them against you. S is for schema markup. It’s pretty rare to see a site nowadays without schema markup. Schema is a type of code that helps search engines process information more efficiently. While content (and fresh content) is good, being able to process that information better is great. There are various types of schema markup, which can be seen here. T is for the title tag. The title tag is the most important element on your site. It describes the entire page and gives users insight into what they can expect from the page they’ll be viewing when they see it in the SERPs. If you want to know how your title tag will look in the search results, you might want to give this snippet tool a look. U is for user experience. If there’s one thing that has an impact on just about everything on this list, it’s user experience. The ways users interact with your site will determine whether they will come back and tell others about it (in a good way). One example that comes to mind is the recent launch of ello.co. This site was designed by designers and artists. It has a great minimalistic look and feel, but the user experience is absolutely horrible. While designers need to work in SEO factors, they also need to keep user experience constantly in mind. Not sure if someone is using your site properly? Try using Lucky Orange Real Time Web Analytics to monitor how users behave on your site. V is for video. Many see video as synonymous with YouTube, but the fact is that there are several video-hosting sites available, each with an embeddable code. Videos are excellent visual aids your site, but they must be handled carefully. Make sure to use embed codes correctly, add schema markup, and, more important, publish a script of the video to help add content to a page that has only a video on it. Search engines can’t process an entire video, but a script of the video can greatly help. W is for W3C validation. Although not everyone agrees that proper code validation impacts SEO, it does pay to make sure your code is error free. When it comes to crawling and processing a site, search engines have improved at getting around errors. But those hiccups may still hinder how long it takes a crawler to find the right information, especially if a site has several errors throughout it. X is for x-robots tags.This tag can be used as a part of the response header for a page on your site. You can use it to tell crawlers not to index a page. The most common application is when you want to specifically block elements of your site that are not in HTML, such as videos and images. Y is for year over year. I know, I know: another element from analytics? Yes, but this one is important. Data from week to week and even month to month can vary on a number of factors. But measuring the same time period year over year can help you compare what was done the previous year to the current year. Were any social campaigns running last year that weren’t this year? What about organic presence? Did seasonality play as big a role this year as it did last year? These questions can be answered, and reviewing last year’s data for an upcoming month can help you plan for that specific time period. Z is for z-index. Z-index helps identify the positioning order of an element. If you were to look at an image’s CSS coding, it would look something like this. Well, I have to say this turned out to be a lot longer than I expected; then again, I didn’t know what to expect. If you have other items regarding SEO that you think would fit for some of these letters, I’d love to see what you have in mind.